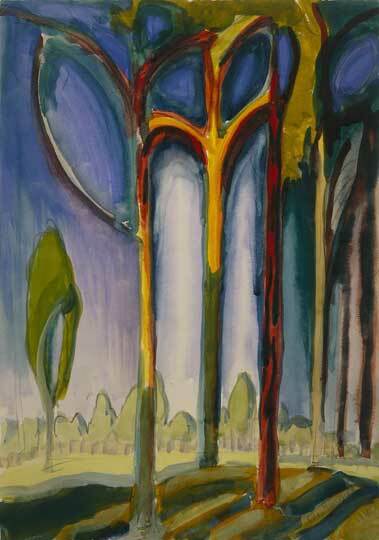 While a show putting Marsden Hartley firmly back on America’s art map is at LACMA, the east coast is spotlighting another mid 20th-century American artist who should be better known, Charles Burchfield (1893–1967). More than 50 of his landscapes are gathered together at Brandywine River Museum of Art, a 30-minute drive out from Philadelphia into a bucolic landscape that has long attracted both the hugely wealthy (two Du Pont family estates, Longwood and Winterthur, are open to the public) and artists from Hudson Valley painters to three generations of Wyeths. The permanent collection reflects this: quality portraits, landscapes, still lifes by artists who lived in the area, and probably the best holdings of the Wyeths. Indeed, from the museum’s own 120 acres visitors can stroll across a meadow to tour the studio of Andrew Wyeth (1917–2009), and see the home of his father N C Wyeth (1882–1945) and Kuerner Farm, with its German immigrant starkness that inspired Andrew Wyeth. Works by Jamie Wyeth (Andrew and Betsy’s son) are in the museum. What drew Wyeth to Burchfield was the way he studied nature obsessively and minutely – he began his lifelong nature journal in 1915 – and then in his paintings enhanced specific sites with his imagination and spirituality to make them mystical, fantastical, creating a kind of sublime nature rooted in reality. Afterglow, painted in 1916, captures a specific moment when the sun is setting. Burchfield echoes Wordsworth’s Prelude when, in later life, he remembers being 24 in 1917, as ‘the golden year of my career. Memories of my boyhood crowded in upon me to make that time a dream world of the imagination’. That same year he devised a set of symbols based on nature, to incorporate in his pictures. The Mysterious Bird (1917) shows a crow isolated in a sky of dark clouds, its curving shape aligned to Burchfield’s symbol for ‘fascination of evil’. Born in rural Salem in Ohio state, Burchfield attended Cleveland School of Art from 1912 to 1916. There he encountered the latest ideas: his teacher was Henry Keller, an exhibitor in the watershed Armory Show of 1913, and local galleries were showing avant-garde artists such as Max Weber and Marsden Hartley. After spells in New York and back at home, he moved to Buffalo to design wallpapers – his first design, The Birches, included catkins and cottonwoods. Around 1919–20 he read Sherwood Anderson’s Winesburg, Ohio, short stories about middle American small town life, and abruptly, for two decades, depicted just that in an almost Edward Hopper way. This foray ended just as abruptly in 1944 when he returned to landscape. He wrote to his New York dealer, Frank Rehn, that he would give him ‘more sounds and dreams and – yes, I’m going to make people smell what I want them to, and with visual means.’ For the rest of his life he made intensely romantic and sensual pictures such as Midsummer Caprice (1945), which suggests the constant sounds and movement in apparently quiet nature, and Early Spring (1966–7), which captures a transitional moment in nature, given spirituality with the golden halo over the trees. Throughout his six decades of painting, Burchfield worked in watercolour ‘like an oil painter, using an easel, and a large format by joining pieces of watercolour paper together’, explains the show’s curator Audrey Lewis. ‘He painted in the wet and dry manners, dragging the colour. It’s really an eye-opening experience to see his work. People expect Andrew Wyeth. 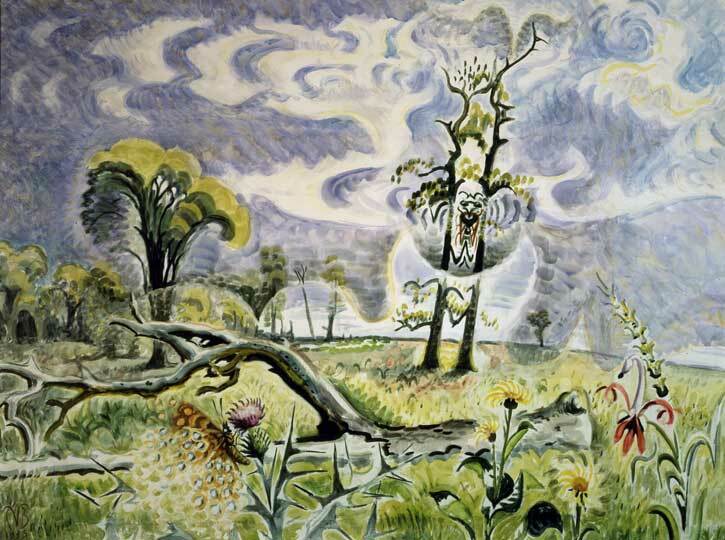 And Burchfield is Wyeth’s inspiration. They were both so absorbed in their surroundings with very different results. They transformed even the most ordinary things through their imaginations. 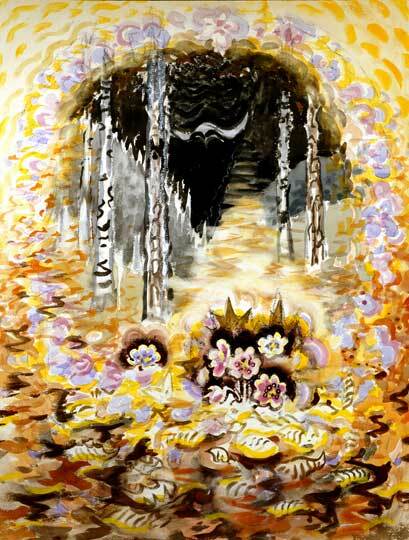 Burchfield had a wild adventurous use of colour. Wyeth was exploring something more dark and serious.’ To see the difference, across the corridor from the Burchfield show hang some 40 Andrew Wyeths. Padon says his shows for 2015 will also complement his museum’s core collection. One is on Horace Pippin: ‘N C Wyeth was instrumental in recognising Pippin, organised his first exhibition. He was quickly taken up by Alfred Barr and given a solo show at MoMA’. Another will be on James Welling, the LA-based conceptual photography artist who has ‘explored the places and landscapes where Andrew Wyeth worked’. He sees him ‘as an astute observer, but much is imagination, not what’s right in front of him’. He could be talking about Burchfield. 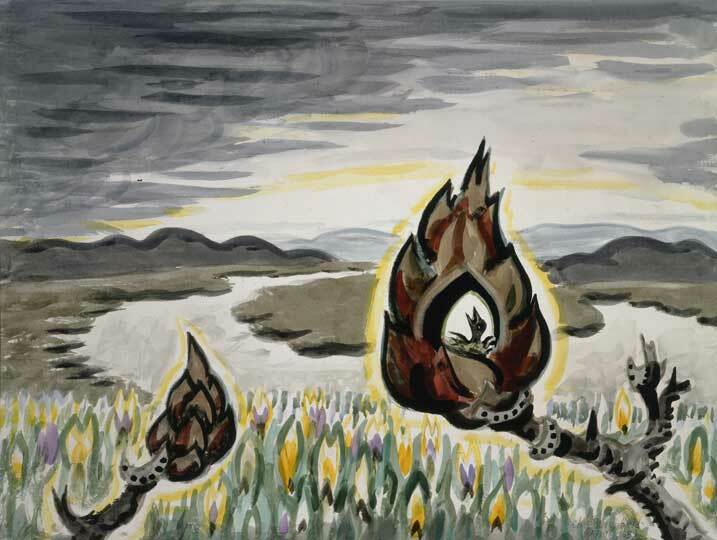 ‘Exalted Nature: The Real and Fantastic World of Charles E Burchfield’ is at the Brandywine River Museum of Art until 16 November; then at the Burchfield Penney Art Center, Buffalo State College, Buffalo, from 12 December–22 February 2015.